Los Angeles Koreatown’s nonprofit organizations are campaigning to amplify the political voice of the community by encouraging more Korean-Americans to vote in the upcoming presidential election, which is set to take place in November. About 10 community organizations, including Korean American Coalition, Koreatown Immigrant Workers Alliance, K.W. 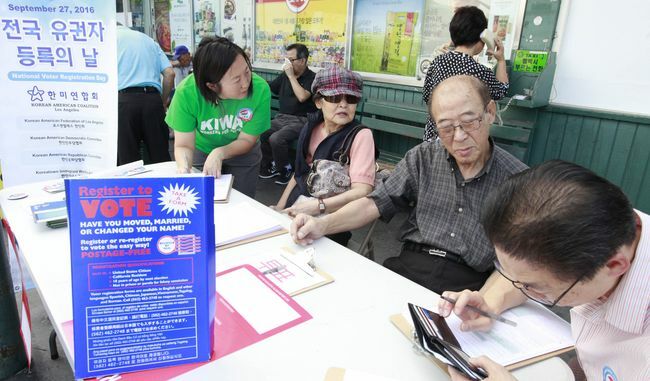 Lee Center for Leadership, 3.1 Women’s Association and Korean American Federation of L.A., held their respective campaigns on Tuesday across Koreatown with booths to help Korean-Americans become registered voters. Many of the Korean-Americans who registered to vote on this day were senior citizens, who never had the chance or proper assistance to become eligible voters. The interest in the upcoming election is stronger than ever, as many Korean-American voters admitting that they have already made up their mind as to who they will support. Approximately eight to nine out of 10 Korean-Americans who registered to vote on this day said that they will be voting for Clinton, according to representatives of the community organizations who held their campaigns. At five booths set up by Korean American Coalition on Tuesday, 491 people have registered as new voters, according to the organization’s campaign organizers. As of July 17, California had approximately 18 million registered voters, while the state’s 6.8 American citizens still remained unregistered. The last day to register for the voters is Oct. 24.